The first version of the KLE RCA is called the Copper Harmony, is a pure copper base version, with silver plating for both the signal and ground/return pins. 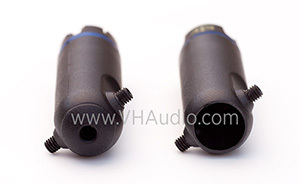 The second RCA version VH Audio stocks is the PURE Harmony. This RCA version claims to achieve an IACS of 106% for BOTH the signal pin, as well as the ground/return pins. The third version is the ABSOLUTE Harmony, which is similar to the Pure Harmony, but has an IACS that is claimed to have an IACS conductivity greater than 106%. 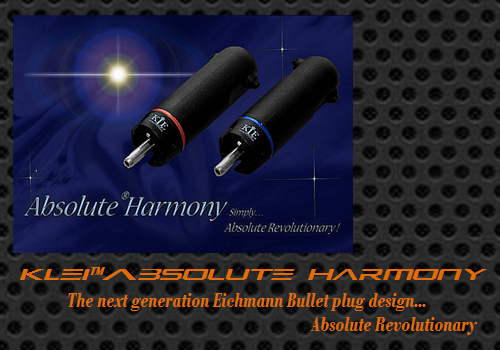 The original Eichmann Bullet Plug RCA was renowned as the first low-mass RCA connctor on the market. It was an all-out assault on the conventional 'wisdom' that huge chunks of metal in your signal path was just fine for audio :-) The RCA jack was a connector designed by the Radio Corporation of America (RCA) over 80 years ago for the connection of a 'record player' to their radios. Despite its humble beginnings, this RCA connector became the deafult industry standard for component connection, and remains so to this day. 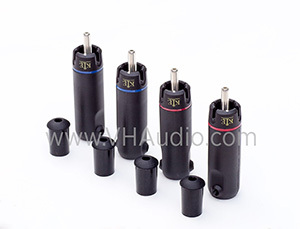 While the ubiquitous nature of the RCA jack offers industry-wide compatibility, it is far from an ideal connector. 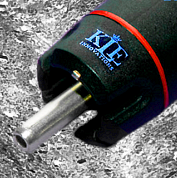 Demonstrating a considerable amount of out-of-the-box thinking, and a willingness to challenge what was taken for granted, Keith Louis Eichmann (KLE) designed and introduced the original Eichmann Bullet Plug in 2000. The plug was an instant success. It simply sounded better. 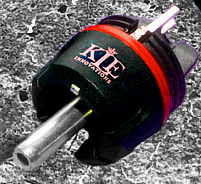 Keith's design eliminated eddy current distortion, capacitive reactance, and micro-arcing. It also offered a new kind of grounding, a radically different architecture, and superior conductivity. 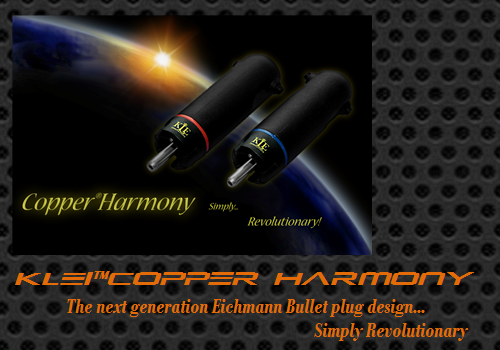 After seventeen years, a patent, a trademark, and numerous copycats, the original Eichmann Bullet Plug has undergone a significant redesign by a new company formed by Mr. Eichmannn (KLEI - KLE Innovations). 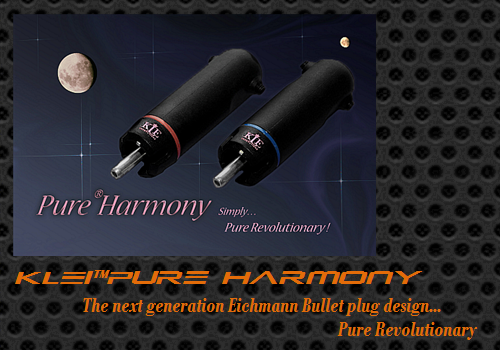 That same outside-the-box thinking by Keith Louis Eichmann, which produced the original Eichmann Bullet Plugs, has been applied with improvements to produce the new generation KLE Harmony (Bullet) Plugs. 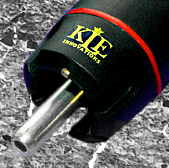 The Harmony Plugs, by KLE Innovations, deliver outstanding performance. Bigger, thicker, and more massive doesn’t add up to better sound. In fact, quite to the contrary. A studied, optimised, and in most cases a minimalist approach to mass actually results in better sound—and better electron flow. KLE’s proprietary signal to ground mathematical formulae, ensure an optimal architectural relationship between all metal components and dielectrics that have been utilized. The result is control, and the avoidance of sonic compromises caused by skin effect. Also, the reduction of EF and EMF interference. Controlling these parameters ensures a complete, full, and extended frequency range, where harmonics are conveyed from component to component intact. This is of paramount importance; and something that’s been central to Keith Eichmann’s designs from the very beginning. Keith is committed to implementing and using, in his current Harmony Plug designs, only conductors that are more conductive than pure copper, and even pure silver. Keith is responsible for bringing IACS (International Annealed Copper Standard) into the audio conversation. Using pure copper (100% IACS) as a reference, the IACS percentage defines a metal’s electrical conductivity relative to pure copper. For example, brass (25%~37% IACS), bronze (15 ~ 48% IACS), and rhodium (35%~38% IACS) are poor to average electrical conductors when compared to pure copper's IACS. Pure silver is even better at 105% IACS. Gold is about 70% IACS. KLE’s Harmony RCA Plugs are all at an IACS rating of 101% or greater, and are breaking the conceptual boundaries that have been previously thought to be absolute. KLEI also rejects the use of passivation for preserving and protecting conducting metals—something touted by some connector manufacturers as being a feature. We are opposed to zinc, zinc oxide or these kinds of coatings, and simply will not knowingly compromise the IACS ratings for unnecessary protection. It is important to note that the Harmony Plugs’ signal and ground pins are harmoniously formed in a way that the metallurgical processes work together and not in opposition to each other – both electrically and mechanically. Extrapolation indicates, electrically, that the utilised metal complements are at least as conductive as pure copper (100% IACS) and/or pure silver (105% IACS). In pure annealed form, pure copper and pure silver are too soft to machine and easily bend. As such, the machinable forms of copper and silver, as used in audio applications, have noticeably lower IACS values than their pure copper and pure silver forms. The bottom line is that conductivity (IACS percentage) is defined by a metal’s formation, i.e. its completed form. No matter how you get there and to quote Keith Eichmann, ‘the proof’s in the pudding.’ The Harmony Plugs excel in this area. Conventional RCAs utilise a metal collar, which encircles the signal pin as the plug’s ground—a configuration which contributes to the kinds of electron turbulence discussed earlier. These disturbances are in the form of electrical eddy currents, capacitive reactance, and micro-arcing. To combat the degrading effects of electron chaos, Keith went way outside the box. He opted for single point grounding, sometimes referred to as star grounding in high-end electronics, where the plug makes single point contact with the female RCA socket. In so doing, he eliminates the metal collar. This is a radical departure from eighty years of RCA connector design, and eliminates every vestige of eddy current turbulence, capacitive reactance, and micro-arcing. When comparing the new Harmony Plugs, to the original Bullet Plug, it is important to note that the new Harmony Plugs’ signal and ground pins have been further and dramatically optimised in terms of shape, mass, and thickness— and are electrically and mechanically superior. 8. Higher conductivity. Calculations indicate a progression in IACS percentage, in the series. Greater than that of Classic, Copper, Silver, or Pure Harmony plugs, arguably an industry best.